We are starting the week out right! 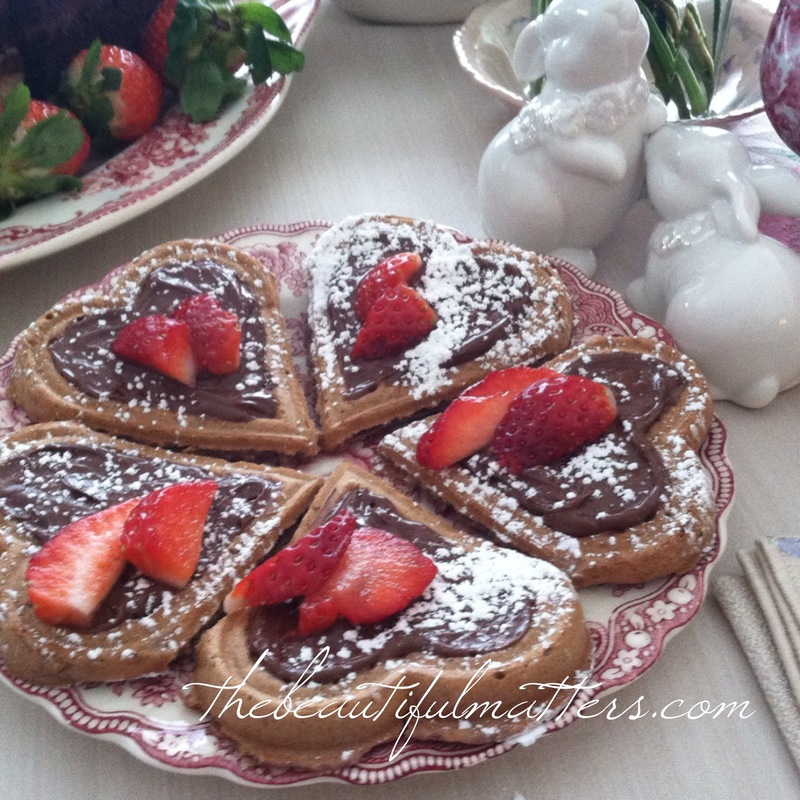 In honor of this month of love, I made chocolate heart-shaped waffles spread with Nutella and sifted with powdered sugar. A slice of strawberry or two on top. We had these with tea this afternoon. Just before book club tonight, I'll cover the rest of the waffles with the toppings and serve them with tea in front of the fire. I enjoyed mine at afternoon tea, but will skip them at book club. I don't need a double serving, plus I am usually too busy talking to eat anyway. Even so, I have to be careful what I eat the rest of the day. Still have 15 pounds to lose. But I read somewhere that people who allow themselves a treat consume 450 less calories a day. Do you think that's possible? Nutella is a rare treat around here. The day I found myself eating it by the spoonful straight out of the jar was the day I had to Just Say No. This is the first time I've bought it in probably a year, so I hope my friends will eat up this jar for me tonight. 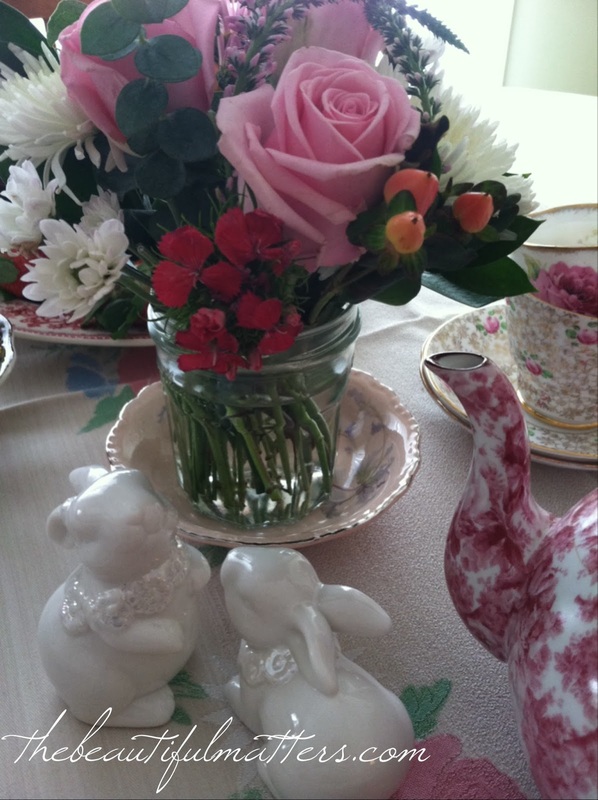 In keeping with a Valentine's theme, we used these tea cups with pink roses on them this afternoon. I chose the June tea cup, my birthday month. I usually only use it in June, but why, I asked myself? I am a great believer in not saving things, but enjoying them. I got this waffle iron at Williams-Sonoma years ago. I recently discovered a great new use for it. Grilled cheese sandwiches! Yes, the hearts get crooked and cut off, but it works. My daughter was able to have tea with me this afternoon. 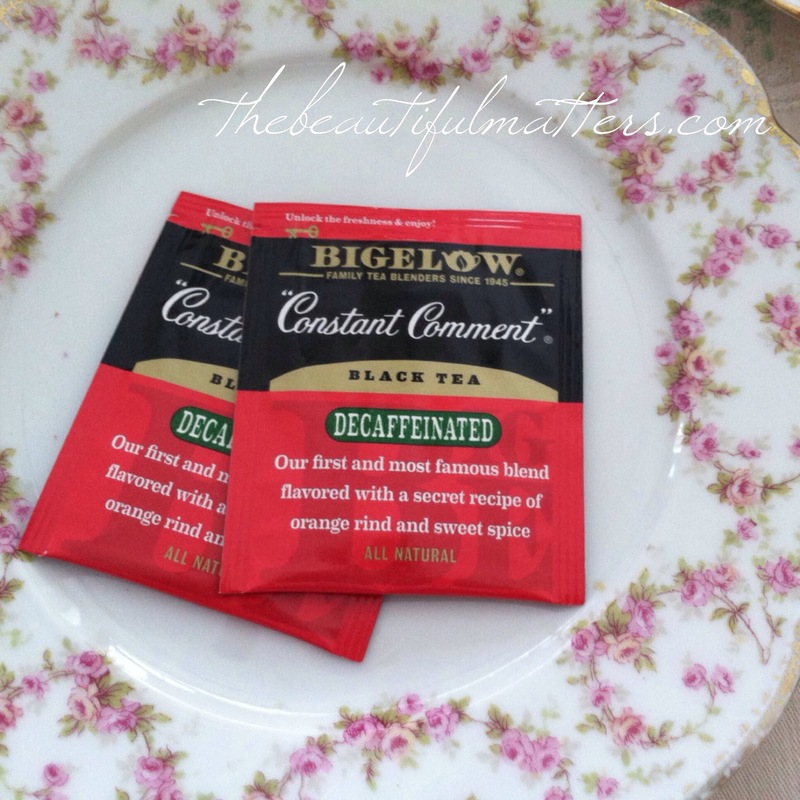 I enjoyed one of my favorite teas, Constant Comment decaf. I really wish I liked herbal teas; there are so many wonderful varieties. But with only a few exceptions, I like real tea, the darker the better. It just has to be decaf after 2 p.m. or so. I have to say as my daughter and I sipped our tea and ate these little goodies, there was silence. Just an occasional "mmmm . . . ," as we thoroughly enjoyed these delicious little waffles. I found out this afternoon that one of the ladies in our book club is celebrating a birthday today so I hurried out and got two little bakery cakes for tonight as well. Tonight we will be discussing The Book Thief. I read it this past week. It was sad, powerful, beautiful. Hard to imagine living through the devastation of WWII. 5 out of 5 stars. 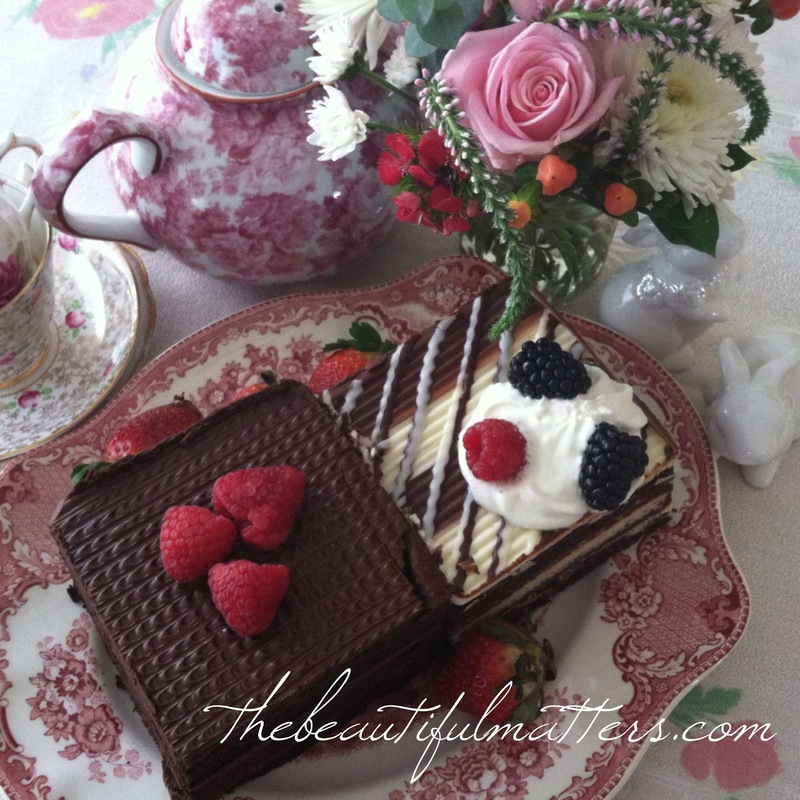 I am sharing at A Return to Loveliness, Sandi's Hearts and Flowers Tea, and Bernideen's Tea Time. We have all the Jeeves and Wooster DVDs. So fun! I think the idea of heart waffles is wonderful. And your tea cup is lovely! I enjoyed your tea party. Thank you, Beth.They were good ;)! 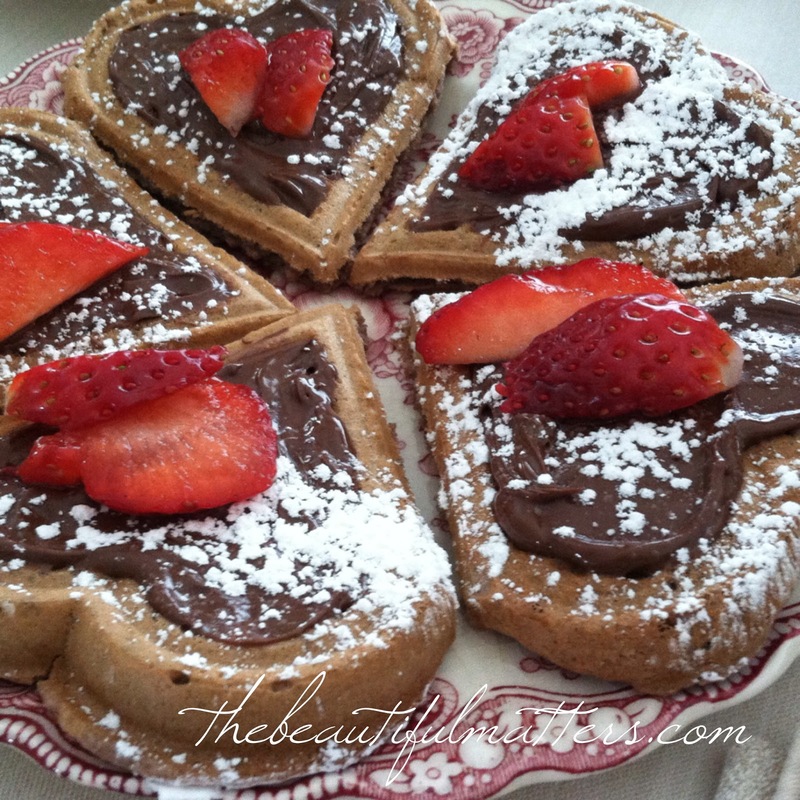 Deborah, your heart waffles with nutella and strawberries would be a real treat for me! 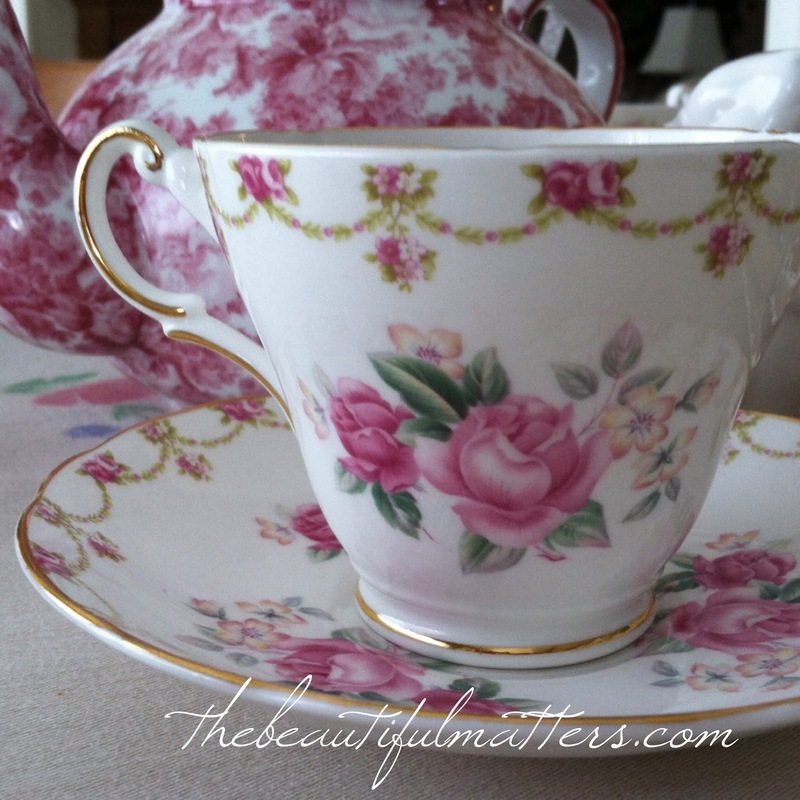 I love your pretty teacup and I couldn't help but notice your gorgeous teapot too. Tonight's gathering sounds like lots of fun. Thank you for sharing and coming to tea. Happy Valentine's Day! thank you Sandi. We ended up with four birthday cakes! at our book club plus the waffles, some Valentine's cookies and chocolates! 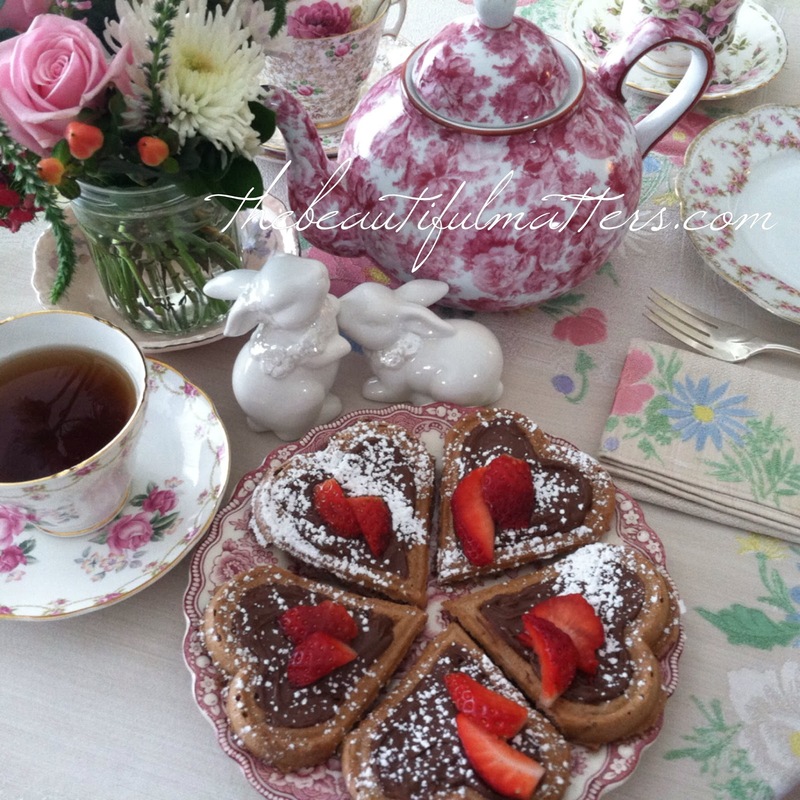 What pretty teacups and what a darling waffle maker! 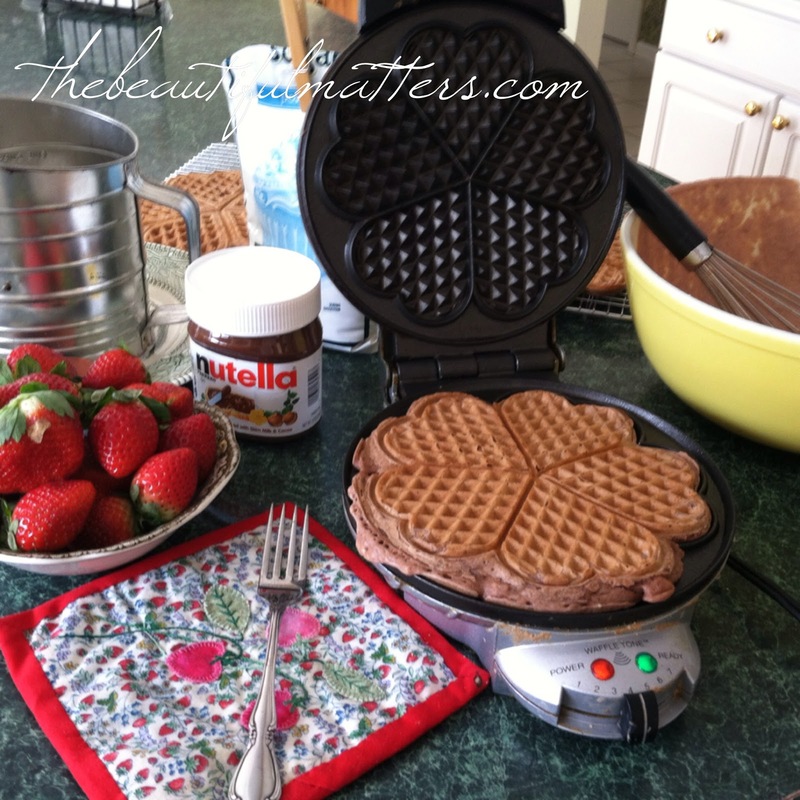 My hubby loves Nutella, so will have to make some round waffles for him. Thanks for the idea! I think Nutella makes just about anything taste good! 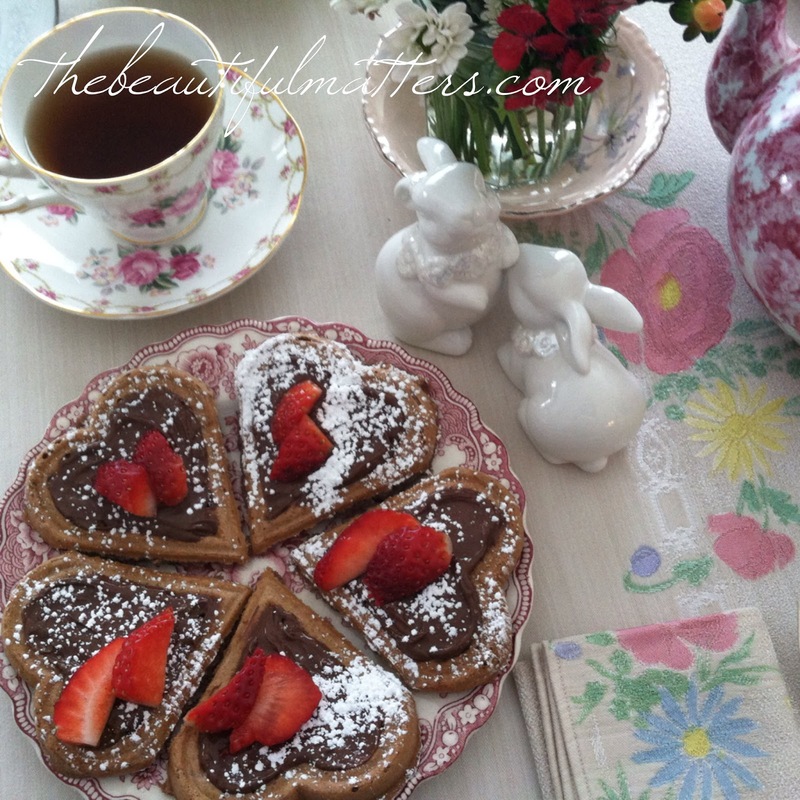 Mmm, I would love a heart-shaped waffle with Nutella on it with tea, a great idea. Easy to make and oh-so good! What beautiful waffles and chocolate ones at that. The use of Nutella and strawberries on top looks yummy. What a wonderful way to have your book club enjoy themselves and how kind of you to have cake for the birthday person. Have a lovely time with your book club! thank you Pam. Will be over to visit your blog today. 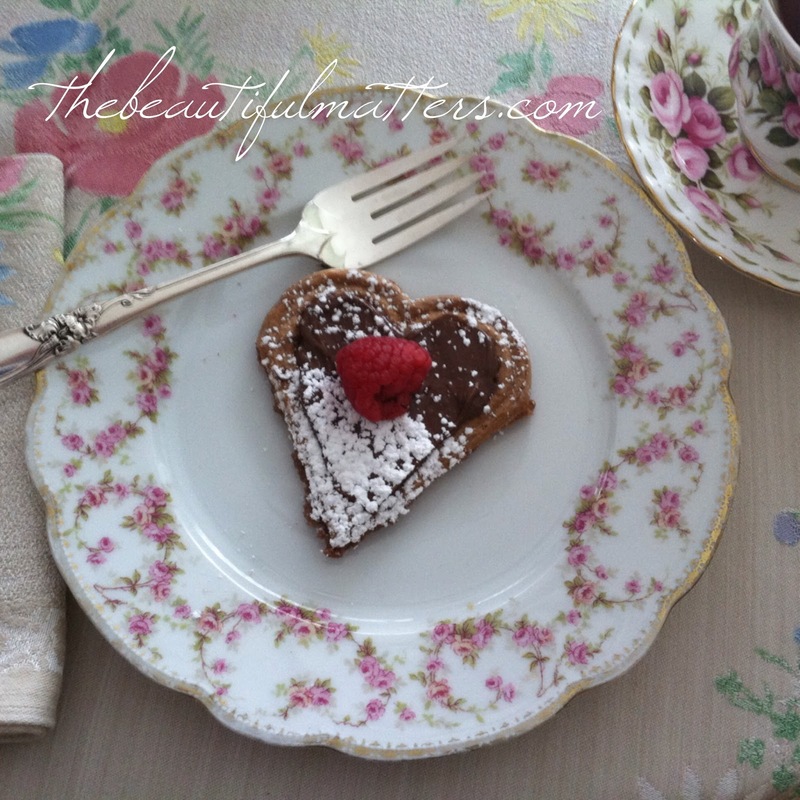 Your heart waffles are lovely, and I'm sure they were delish with Nutella and strawberries. I love Nutella but I need to keep it out of my cupboard - I, too, have eaten it straight out of the jar. Yum! Hope you enjoyed book discussion group. Oh good, glad to know I'm not the only one! Those are such perfect waffles - ah yes - breakfast in bed would work too! 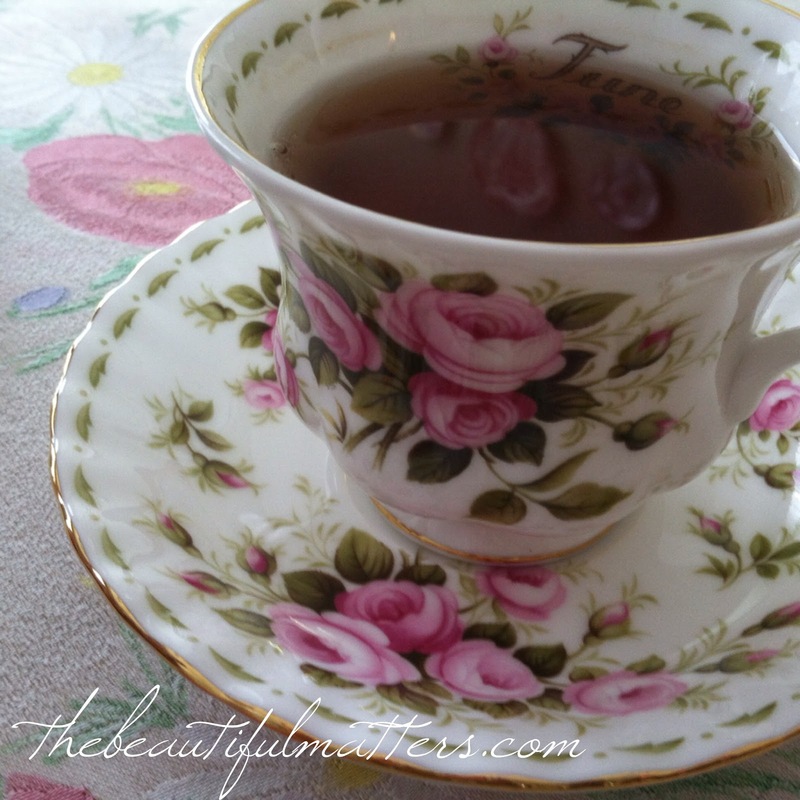 What a lovely posting and so glad you shared at Friends Sharing Tea! hmm . . . for breakfast in bed on my birthday? sounds like an idea I could pass along ;)! thanks Martha, for stopping by. As a new blogger, comments are so encouraging to me. I love getting them! 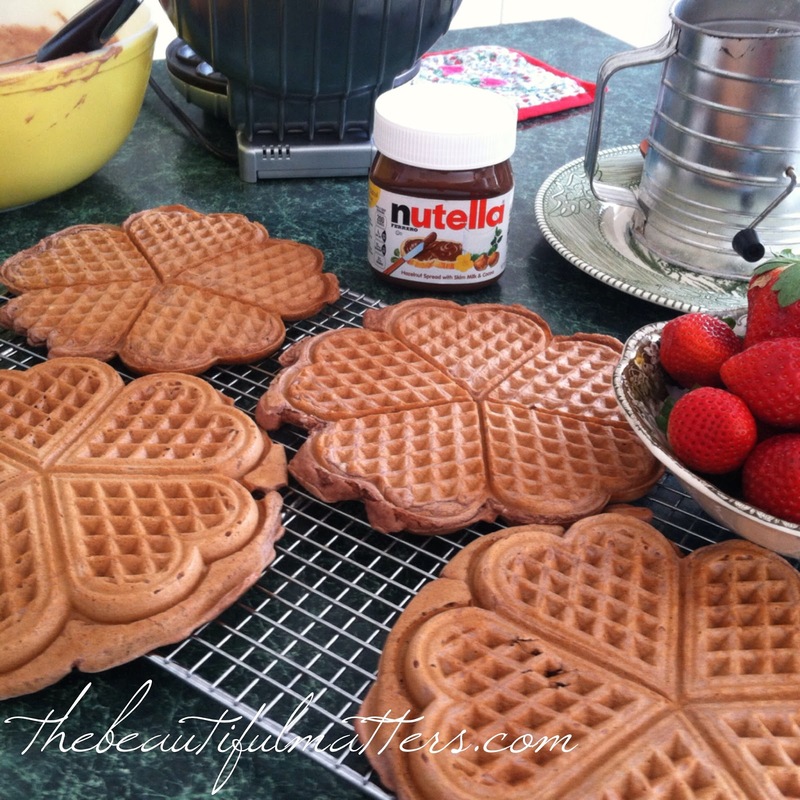 Love the heart shaped waffles - look delicious! The china is so pretty and romantic. thank you Liz. I will stop by your blog today to "meet" you! What a gorgeous post on one of my favourite breakfasts (or lunch or snacks or dinners!). Your book club friends, I'm sure, enjoyed their meeting at your lovely home, with such an elegant tea and delectable treats! Beautifully photographed, thanks so much for sharing. Hope to see you again at Poppy View; loved having you over! thank you Poppy. Actually, my name is Deborah :). I loved visiting your blog, esp. fun to meet someone from Greece. My daughter was there for 3 weeks when she was in college, and absolutely loved it. Thank you Rosie. I know you are a new blogger too. Hope you are enjoying it as much as I am! The waffles look delicious. My husband loves Nutella on his toast at breakfast - Nutella and a slice of Danish cheese because that's what he ate as a child. Too rich for me, but I'd enjoy one of your waffles in the afternoon with a cup of tea! I was going to ask what book you read for your book club, and was glad when you told us. Our book club just read Why Men Lie by Linden MacIntyre, and this month it is The House that I Loved by Tatiana de Rosnay. We read de Rosnay's Sarah's Key. Haunting. Love my book club. Your husband must be European I would think, as Nutella is a traditional breakfast topping there I've heard. My daughter is going to make Nutella crepes this week! She says they're delicious. They were ;)! I'm afraid I ate more than intended! Those look so pretty ~ perfect for Valentine's especially! Love the waffle iron too. That waffle iron has been a good friend! 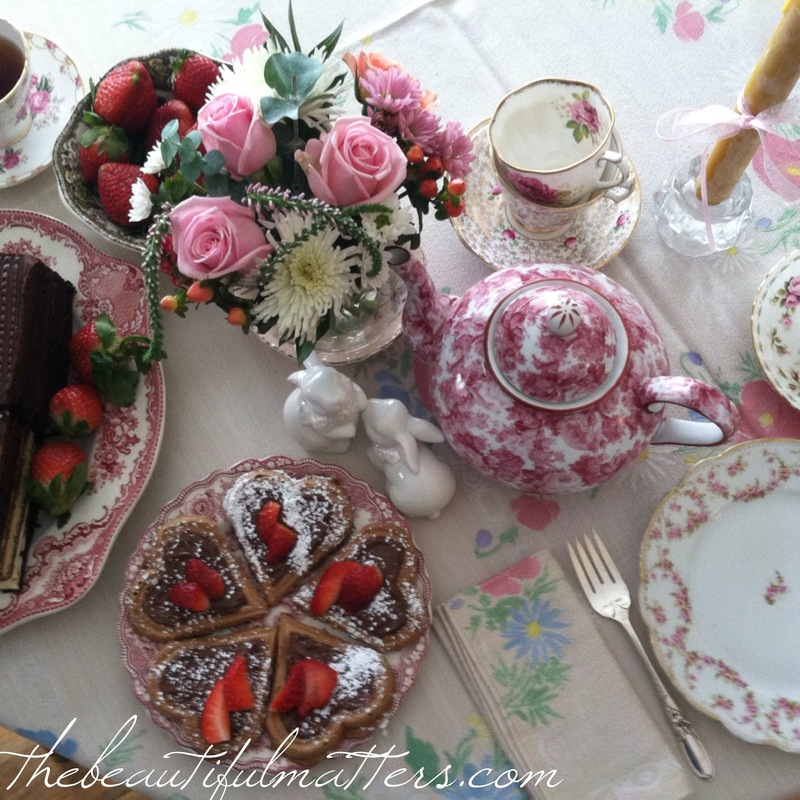 What a beautiful tea time - so lovely and romantic! So glad your daughter could join you for such loveliness. You know I haven't thought of using Neutella for tea time, great idea- there's so much one may do with that versatile yumminess! Oh, my word, yes :)! This is lovely Deborah! I know those wouldn't last long at my house! They didn't last long here either!! Deborah those heart shaped waffles are stunning! 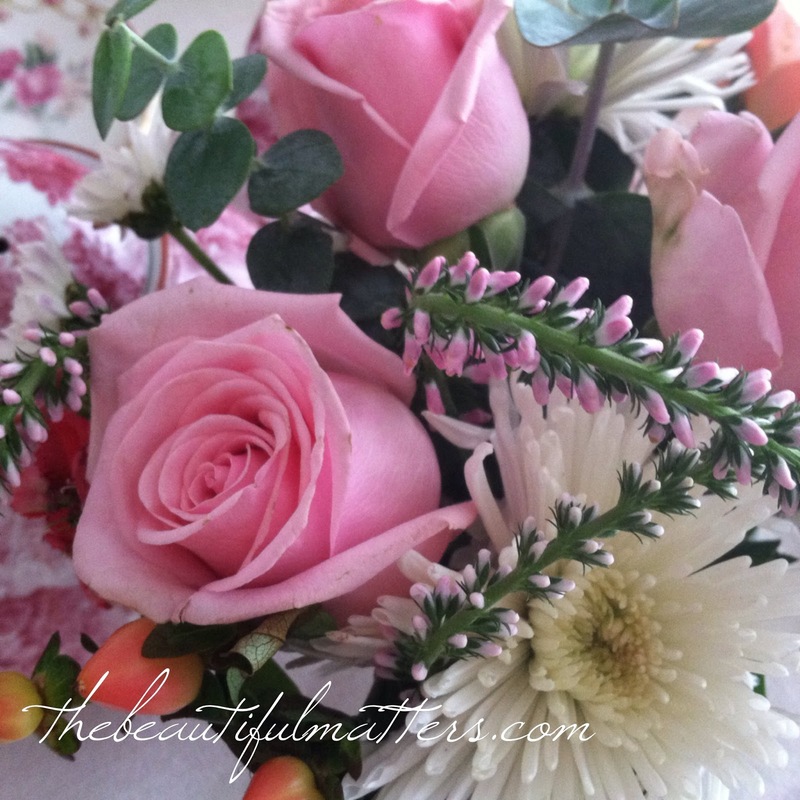 How romantic or for anytime you want to make someone feel super special! I happened to find a gigantic Nutella at Costco in the fall for $35! I think it has to be like 5 lbs. I have to bring it out for company - no one can believe it! wow -- super dangerous for me to have that!! Your waffles look so lovely and delicious! And I think I have a few dishes from one of those sets you show us -- the plate that the CC teabags are sitting on. Mine is Haviland, "Varenne," I think. Looks very much the same! A pretty pattern. My grandmother worked in the china department of the Diamond dept. store years ago, and she gave those to me. I had to get out the magnifying glass! It is Bridal Rose made by MZ Austria. I only have the one plate which I got at an antique store. Love it. It would be dangerous for me to work in a china department :)!